In our last installment of the Letters from Sweden we looked at the panelization technique used by the Swedes and some of the administrative barriers to its adoption here. Today we'll pick up where we left off and consider some of the products that go into the Swedish panels and how they support the panel building technique. We'll look at windows, how Swedish window units are different than US window units, and how this plays out in the construction. In Sweden the windows are installed into the wall panels on the flat (inside up) after they are framed. The windows are designed to fit flush with the panel's outside so when they go in the window face is flat on the table flush with the framing. They install the window units with adjustable fasteners which allow the windows to be squared after the panel is installed and is stable. Think of the adjustable european hinges in your kitchen cabinets. If you've built something bought at Ikea you've handled these. You know how they allow you to adjust the door panel to sit square with the cabinet frame. 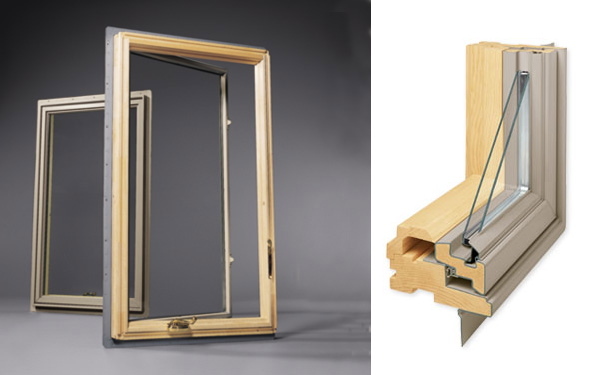 The Swedish windows are mounted with hardware that allows the same adjustability to the window unit. Lifting the panels into place is likely to cause some sort of movement in the panel, and this adjustment allows them to be made square after installation. 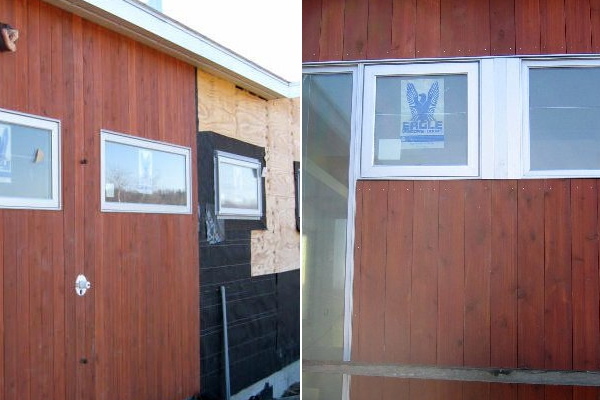 When the wall panels are flipped over to install the siding the windows are trimmed and a metal sill extension added. Here you see the Swedish window after the panel is flipped, before siding is installed, the metal sill in place. In the second image the siding and trim has been installed lapping over the window unit. In contrast our windows in the US don't included adjustability like this. 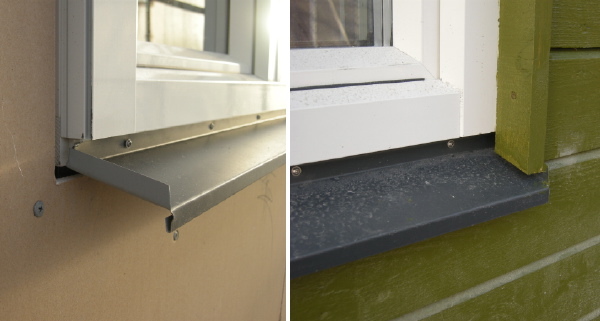 In the field our windows are fastened into the rough window openings from the outside using something known in the industry as a "nail-flange". The windows project from the wall surface and are self trimming providing a standing edge fore siding or trim to terminate against. 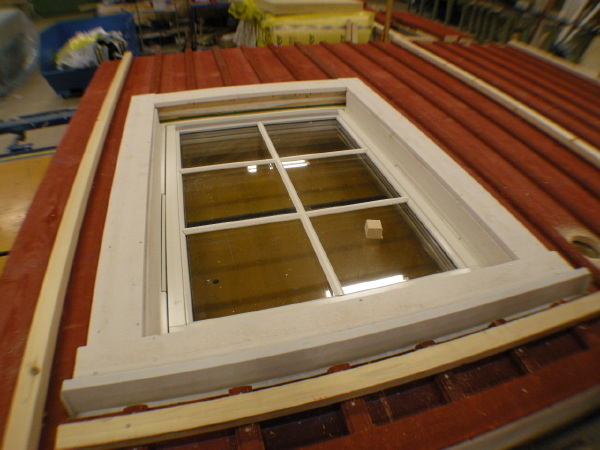 The siding and exterior trim are installed over this flange locking the window into the construction. If the house ever settles or moves the wall will take the widow with it racking the frame, likely making the window stick or jamb. Not as likely to happen with on site construction, but a distinct possibility with handling large wall sections. Here you can see a typical US style window, Andersen. The nail fin clearly seen at the edge of the frame, fits against the sheathing. The rest of the frame extends out creating an edge for the siding to terminate into. Here a typical US style window installation, Eagle. You can see the siding material is butted directly against the side of the frame. So can we build using the Swedish panel technique with our US style windows? That is a good question. Perhaps. It would require a change in sequence. Our windows would have to go in as the first step on the outside work on the panel. But the more the panel is handled the more likely the window is to be out of adjustment when the panel is finally installed. If the window was damaged in handling it would require a good deal of the panel to be disassembled in order to replace a window unit because of the siding attached over the nail flange. The Swedish windows could be swapped from the inside leaving the siding and trim in place. So yes, it can be done, but the US windows obviously have a lower tolerance for error so to speak. The Swedish windows anticipate these issues and accommodate them. Thanks to Scott Hedges for the Swedish factory photos. Next we will look at wiring. Letters from Sweden - Europe is different, Sweden is not, sort of.. Thanks for this series - I'm learning a lot, and would love to travel to Sweden to see the performance of these completed houses. You and me both. I visited there 18 years ago, but I was looking at Architecture, and not houses. Yet I still remember things like windows and door hardware being remarkably different and better than what we use here. 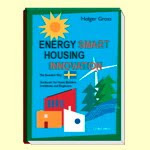 The energy performance of their everyday houses are much better than ours. High insulation values. triple glazed windows. Its hard for such practices to take hold here since its only cold enough for it to be marketable in a small northern band of our country. At the end of the series I'll try to do a wrap up where I link to a bunch of different manufacturers. This is totally fascinating. I've been wondering about this issue concerning doors. We've noticed that most flat-packed houses have sliding doors, I assume because they are flat and flush during transport? We'd love to make our doors such that they could easily be factory installed and flat-packed for use in houses like these. Currently, as you pointed out, the industry standard is to create a jamb and sill (threshold) that juts out, preventing a truly flat delivery and, like you said, increased the liklihood that the door frame would warp during wall installation. I'd love to hear more of your take on this, thanks!! Christiane, they are installing wood strips over the finished walls to protect the sills, and the wall finish from small bumps and rubs during handling. I imagine that the same thing could be done for american style windows and doors. I enjoyed looking at that door site, and kudos to the designers and effort behind it. I've been very impressed at the elegant and energy efficient solutions the Swedes have for doors. Their doors don't just close, they seal shut. Swedish entry doors open out so they don't meet use code, but it would be well worth the time to look at their production techniques, hardware and weather strip solutions, which are very clever and can be imported no problem. Residential entry doors in the US can swing out - code does not restrict that. Its just not customary here, probably because of screen doors. But it makes so much sense in an emergency that your door swing out, the direction you are traveling. Oh - and Crestview Doors Rock! Big fans of what you are doing here! Can someone tell me or show me more about how they do the adjustable windows in Sweden. Allso anyone got information on how they connect the wall panels together and to the floor. I don't have any images of the connectors but maybe we can come up with some.